Note: After hearing about the district's increase in English-as-a-second-language teachers while covering a school board meeting, I pitched this story to the editors of the J&C. Kindergartner Enrique Medieta was busy running his fingers along a world map rug in a Glen Acres Elementary classroom as his English teacher, Marge Hemmer, smiled at him. He was sitting on the part of the rug where Indiana is located. She was on South America. "Enrique, escucho!" Hemmer said, knowing it would be silly to tell him "listen" in English. The boy's family moved from Mexico to Lafayette two weeks ago. He's one of 1,900 local students being evaluated in English proficiency this month. The evaluations are through a statewide test called LAS Links. The exam is required for any student whose parent indicates on a survey that a language other than English is spoken in their home. non-English-speaking population has grown and is growing in Greater Lafayette and across the country. The children of that population are integrated into local classrooms and are expected to learn English rapidly. Gabby Salazar, an aide at Glen Acres, said no matter how much in- school instruction is offered, it’s a difficult transition for students to make when their families typically don’t speak English in the home. 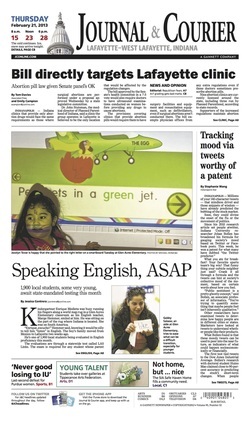 The LAS Links test assesses K-12 students on listening, speaking, read- ing and writing. Grade levels determine how the five versions of the test are administered. Every year, the test results determine students’ level of English proficiency on a scale of 1 to 5. A score of 5, or “fluent,” has to be achieved for two consecutive years in order to test out of English-language programming. A common objection to the test is how early it is administered. Other state-mandated standardized tests, such as ISTEP, don’t begin until the third grade. But testing does indicate strengths and weaknesses, which is useful to teachers. “If you see that they are strong in speaking but not reading, the teacher knows that they need to work on the student’s reading skills through speaking,” Ward said. With a 12.1 percent Hispanic or Latino population, the dominant alternative language in Greater Lafayette is Spanish. In Lafayette School Corp., Ward said only five or six other languages are spoken. In West Lafayette and Tippecanoe County schools, there is more variety. John Maylath, Tippecanoe School Corp.’s English learning coordinator, credits Purdue for the diversity. More than 50 countries are represented in the district. Although diversity is an asset in many ways, it can limit the effective- ness of English pro- grams. Brenda Sadeghi, an English-language teacher in West Lafayette schools, teaches students from Korea, China, Japan and Puerto Rico all in one class. Due to the No Child Left Behind Act of 2001, all school corporations receive money from the Indiana Department of Education to provide English-language instruction. They hire English teachers, aides and tutors to provide language help. This year Lafayette schools hired one additional English aide for every school. At the elementary level, most programs are considered “pull-out.” Students are removed from the classroom during English and extracurricular periods to work on reading, writing, listening and speaking skills in small groups. As the students age, programs are more “push-in” focused — aides filter into regular classrooms to help language-learners as needed. At the high school level, students typically take an “English as a native language” class. As with any program, the schools wish they had more funding to update curriculum and add staff. Last year, every Indiana school was allotted $127.29 per limited-English student. House Republicans proposed a two-year state budget that would increase funding for English learners by $5 million, raising the per-student allotment to $200. The House Democratic counterproposal, which will be introduced at the Statehouse today, seeks a $10 million in- crease. It would guarantee $300 per English learner to every Indiana school over the biennium. “It has been proven that if you work with our Hispanic students that may not speak English at home, but immerse them in English in the schools, they do very well on the ISTEP and other tests,” state Rep. Sheila Klinker, D-Lafayette, said. Ward, the Lafayette schools English coach, said more money would mean more personnel, and therefore more improvement.